Collections are offered one Saturday per month April through October to offer residents of the City of Racine, Caledonia, Elmwood Park, Mt. Pleasant, North Bay, Sturtevant & Wind Point an opportunity to safely dispose of their Household hazardous waste. NOTE: Solvent containing products have the words: flammable, combustible or contains petroleum distillates on the label. Any products with acetone, xylene and methylene chloride may be brought to the collection. Some retailers accept rechargeable batteries. Call 1-800-8-BATTERY. These items are not considered household hazardous waste. The City of Racine provides an outlet for these items. Waste oil and waste antifreeze can be dropped off at the City Garage at 830 S. Marquette Street. If you have these products intermixed or contaminated then they can be received as HHW at our collection location. At every collection, in every part of the state, paint is the most common material delivered by Wisconsin citizens. Encouragement to use up leftover paint or give usable paint to a neighbor has not decreased the amount of latex paint significantly. Today's latex (water-based) paint has a very low level of toxicity. Disposing of it at a household hazardous waste collection day is very expensive. Therefore, the City of Racine encourages people with unwanted latex paint to use other options. 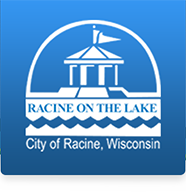 Who can use the Racine HHW site? Residents of the City of Racine, Village of Sturtevant, Village of Elmwood Park, Village of Mt. Pleasant, Village of Caledonia, Village of Wind Point, Village of North Bay can use this facility. Residents need to provide proof of property ownership in these municipalities. Proof can be made with either a driver’s license or a property tax statement. A program funded by the residents of the City of Racine, Village of Sturtevant, Village of Elmwood Park, Village of North Bay, Village of Wind Point, Village of Mt. Pleasant and Village of Caledonia.